We’re in France for the next few weeks, revisiting some highlights from the family’s year long sojourn here twenty years ago. 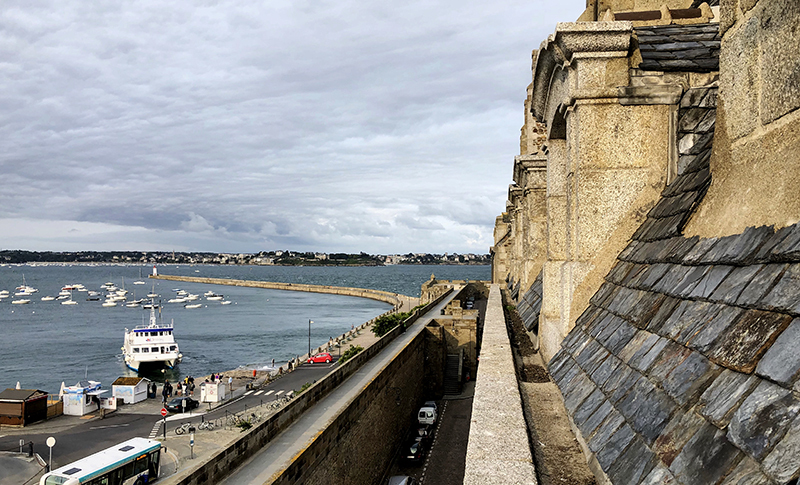 We have begun as we did in 1998, with a visit to the Brittany coast, and we write you today from St. Malo, an old fortress town on the English channel. We’re surrounded here by boats, seagulls and salty air, and so oysters and other fruits-de-mer are never far from our mind. How the oysters of France rank next to our own from Harpswell Sound is a matter of debate, but one thing isn’t: they both pair terrifically with Muscadet. Martin-Luneau is a family domaine farming old vines on the plains south of Nantes. Today we’re suggesting their 2014 Gorges Muscadet de Sèvre et Maine. This wine has the “Cru” designation, combining exceptional terroir with extended years on the lees. The result is an unusually complex take on a classic. This Gorges matches perfectly with cold oysters, summer heat, or both. It’s pure and clean, showing melon, dried spring flowers, and lemon zest. The mouth is smooth and very dry, with notes of salt air, stones, and green apple skins. It’s refreshing and full of energy. Our family is a bit older and bigger than it was two decades ago (we’ve added a wife and a third generation, and tripled our eligible drivers) — but French food pairing traditions have barely budged. And with a pairing like oysters and Muscadet, why would they?